Montefiore Health System stepped outside its comfort zone for its latest honor—and into the klieg lights. "Corazón," a 48-minute film the system financed to promote organ donation, is a finalist at the Tribeca Film Festival. The film debuted April 20 and is competing in the Tribeca X category, which honors "storytelling supported by a brand recognizing the intersection of advertising and entertainment," according to the New York fest's website. The short film, which features several Academy Award nominees and winners, is based on a real doctor-patient relationship. It tells the story of Elena Ramirez, young and suffering from a failing heart, who couldn't get the life-saving care she needed in the Dominican Republic. Dr. Mario Garcia, Montefiore's chief of cardiology, was volunteering in his hometown of Santo Domingo when he met Elena and helped bring her to New York for a mechanical-heart surgery. She's still waiting for a heart transplant, the filmmakers say. The Bronx-based system is partnering with Donate Life America in a #GiveYourHeart campaign encouraging organ donation. 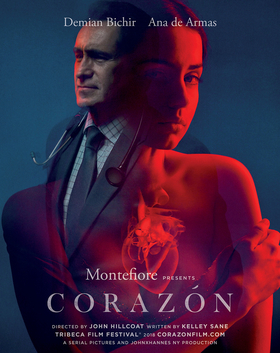 "Not only did Montefiore completely fund Corazón, we facilitated this concept as the most authentic way to tell the real-life patient story in a new, innovative and effective way," said Loreen Babcock, vice president and chief marketing officer at Montefiore. Babcock describes it as a call to action to help the 115,000 patients in the U.S. currently waiting for a life-saving organ donation. "Twenty-two people die every day because there simply aren't enough organs," Babcock said. "If 'Corazón' can bring that number down to even 20 people a day, then Montefiore is fulfilling its promise of doing more." The film is available for free online viewing at corazonfilm.com.